What a cool gadget for the guy into reading and certainly a great gift idea for a birthday, Christmas, Father's Day, retirement or any other special occassion. 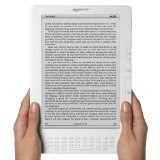 The Kindle DX: Amazon's 9.7" Wireless Reading Device (Latest Generation) is as thin as a magazine and holds up to 3,500 books, newspapers, magazines, and documents. For travel, he no longer has to pick and choose which reading materials to fit in the carry-on; he can now carry his personal and professional libraries with him. The Kindle DX has more cool features than we can mention here, click here>> for the many great reasons why the Kindle DX should be considered as your next gift idea for him.